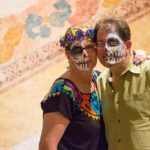 Join us on this guided group tour to the heart of Mexico’s Day of the Dead celebrations in Oaxaca for a unique and authentic Mexican experience. 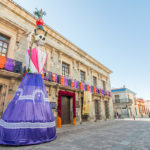 Discover all there is to know about this Mexican holiday. 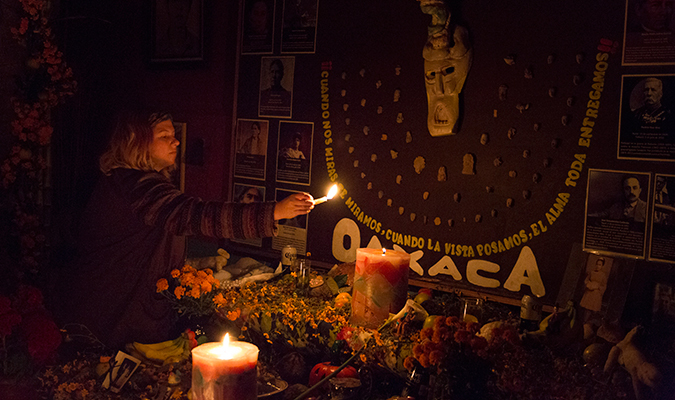 Immerse yourself in the celebration of Day of the Dead in Oaxaca as its communities prepare to joyfully invite their loved ones’ spirits back to earth with stunning displays and celebrations. 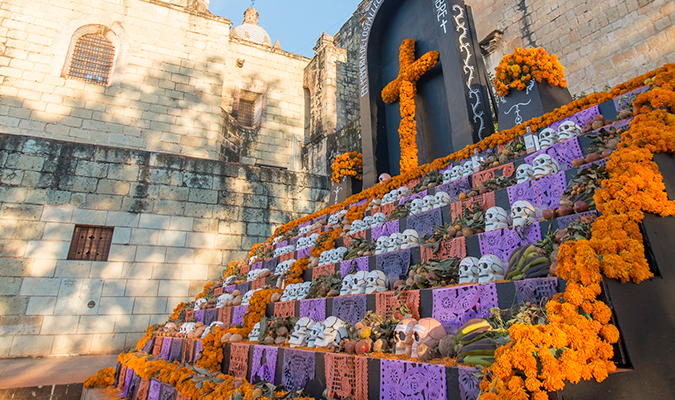 You’ll be captivated by colorful altars, bustling local markets, and vibrant festivities as you gain an intimate understanding of this unique celebration that honors and celebrates passed loved ones. Upon arrival to the airport, meet your guide who will be coordinating your transfer to the hotel Hotel Quinta Real Oaxaca. 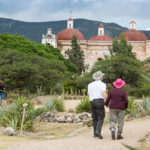 Check-in to the lovely Quinta Real Oaxaca, where you may relax and wander this historical property or choose to stroll the city streets before meeting your guide at for briefing and welcome dinner at Casa Crespo. 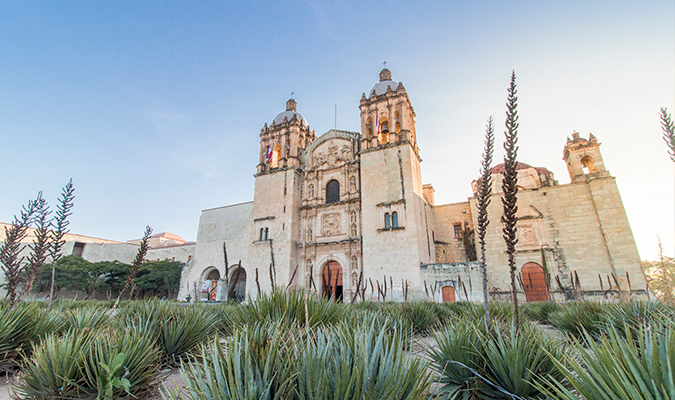 Your guide will meet the group at the hotel and lead you through the colonial UNESCO World Heritage city of Oaxaca. 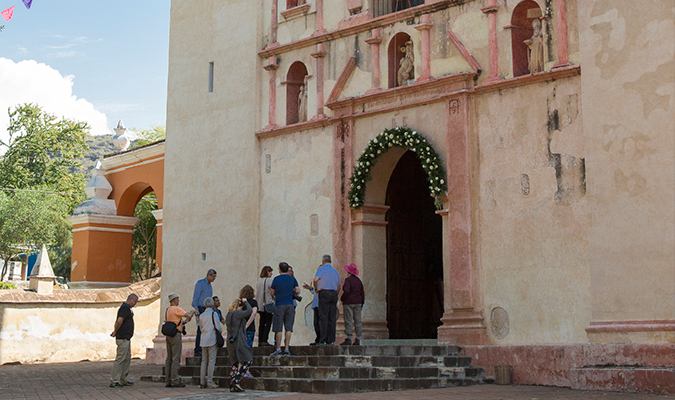 Walking its cobbled streets, observing its vibrant squares, colonial structures and numerous churches, you will learn about Oaxaca’s historical and cultural importance. 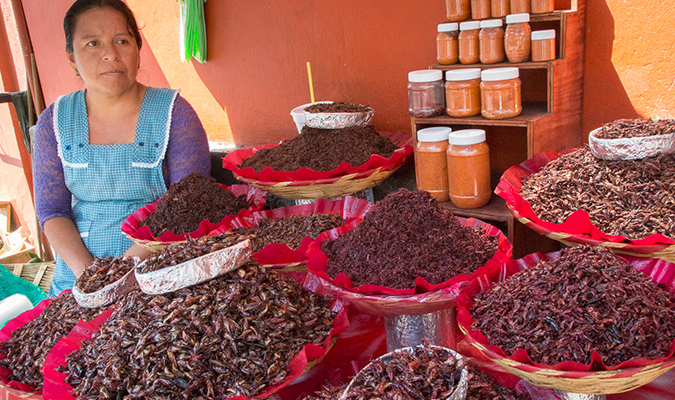 You will be guided through the central plaza (Zócalo) to the largest central market of Oaxaca, where you will learn about the different handicrafts of Oaxaca before trying samples of foods such as Oaxacan cheese and grasshoppers. Next, you will head to the traditional chocolate mills to see how they work and taste Oaxaca’s specialty chocolate. 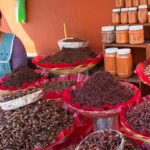 During the day, the group will have time for lunch at a local restaurant to taste and sample some sample specialty dishes of Oaxaca’s rich cuisine. In the evening guests will have free time to wander in the city center or go back to the hotel. This full-day experience will take the group on an exploration of the art of mezcal production and a journey into Mesoamerica at the ceremonial site of Mitla. 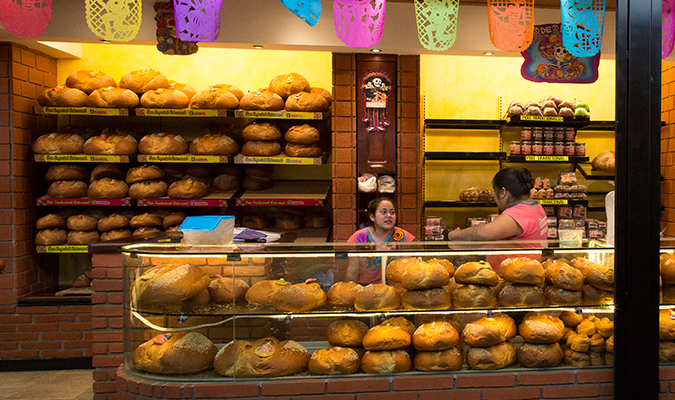 We will also stop at a bakery for an overview of the traditional bread used around the country in Day of the Dead celebrations. 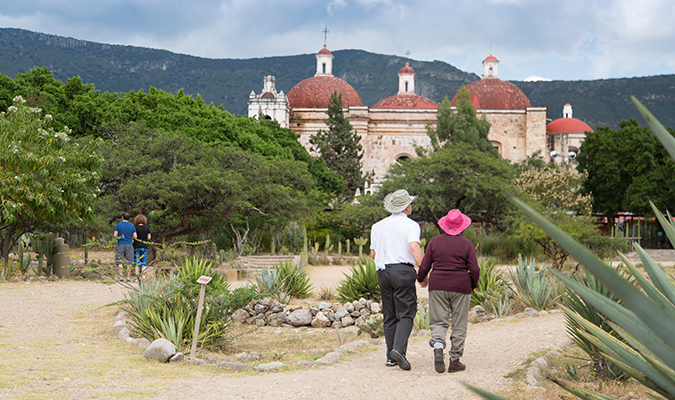 Starting in Mitla, explore its tombs and intricate mosaic work. Your journey then leads far away from the regular tourist mezcal hotspots, where you will meet real, quality producers of the traditional liquor who will teach you about the different distillation techniques used to make, what locals refer to as the elixir of the gods. 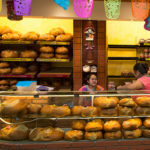 Before heading back to Oaxaca, the group will stop in a small pueblo famous for its production of pan de muerto – a special bread only made during the season of Dia de los Muertos.We will visit one of the 20 bakeries in town and learn what the shapes on the bread means and why it is used so popularly throughout this holiday as an offering to the deceased. 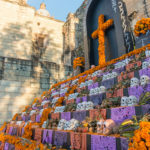 Prepare yourself for a long day full of new experiences that will bring you closer to understanding the history and intimacies of the Day of the Dead. The day begins with a visit the sprawling central market of Oaxaca, covering several city blocks. 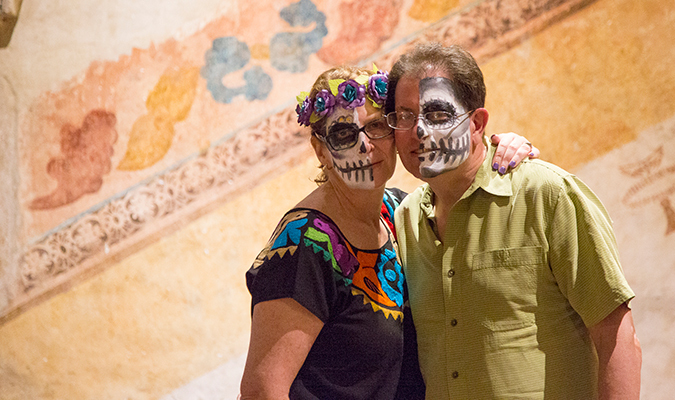 During the week of Day of the Dead, the market is full of vibrant, seasonal offerings and you will have a chance to see the locals hurrying to buy fresh bread and marigolds, candles, incense, sugar skeleton skulls, and more traditional altar offerings for tonight’s observance. 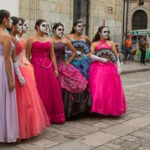 You will be captivated by the sights, sounds and smells of the bustling market in this unique experience of getting to see how Oaxaca prepares for this very special night. 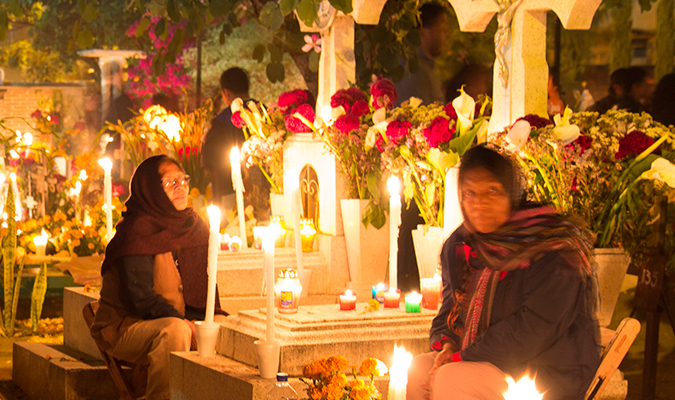 After the market, our day continues towards the local cemeteries to observe how typical “Altares de Muertos” are made. 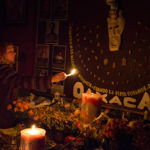 You will learn the significance behind each aspect of the altar, such as what the levels, gifts, and offerings represent, and the cultural beliefs between the connection of life and death on this day. First stop at San Miguel Cemetery, one of the many sacred places in Oaxaca, for an inauguration event where magic explodes in the form of ten thousand candle flames, softly swirling and beautifully illuminating 2,000 niches of the cemetery. We will then continue towards the small village of Xoxocotlan to meet a local family and share dinner as special guests in their home. You will have a chance to try the traditional tamales, pan de muerto bread, and the special hot chocolate that goes with it. After dinner, we will join the family on their visit to the local Xoxocotlan cemetery and help them decorate one of their ancestors’ tombs. 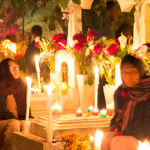 After midnight, you will witness how the entire town gradually fills the cemetery with flowers and candles, adorning the graves of their loved ones and sitting patiently by the tombstone all night waiting for their loved one’s arrival. 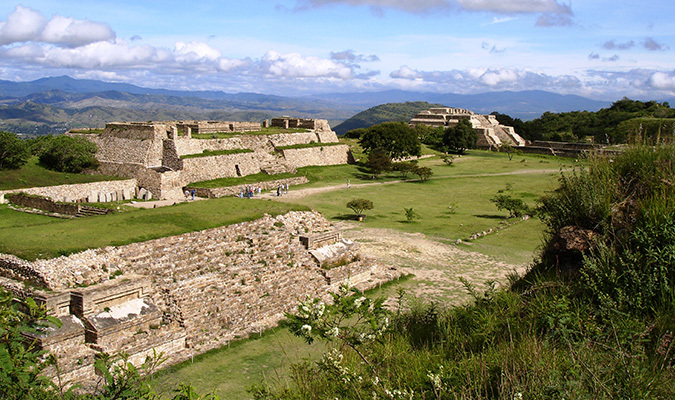 Today, the group will visit Monte Alban, one of the oldest cities of Mesoamerica, known for its importance as a ceremonial center where more than 150 tombs have been found. A site of the Zapotecs and the Mixtecs, it is still considered a sacred site by shamans today. 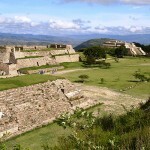 Explore the site with our bilingual guide who will lead you around, explaining what is known about Monte Alban and what still remains a mystery. 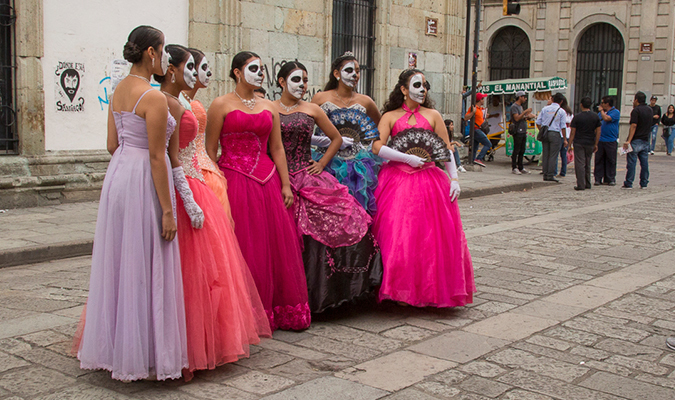 After your visit, enjoy a traditional lunch in Oaxaca’s north valley and then witness the famous comparsas, a carnival-like event special to Dia de los Muertos where locals dress up in colorful costumes and parade through the streets. We will walk with the locals for a while as we admire this unique celebration. Once we are back in Oaxaca City the rest of the night and dinner will be at leisure. Departing from Oaxaca late in the morning the group will visit Teotitlán del Valle where Zapotec traditions live on in contemporary form within the woven goods. 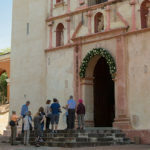 Visiting the town, whose church lies on visible remains of a Zapotec temple, you will meet a family of weavers and be shown how the wool is processed and how they make a huge variety of colors using natural dyes such as cochineal, violet and pomegranate. You will also be able to see how traditional Zapotec designs and glyphs live on in their contemporary work. Our experience will include a lunch and cooking class hosted by an indigenous Oaxacan family to their local dishes. We´ll not just observe our friends working in the kitchen but also accompany them as we learn how they cook with Nixtamal, one of the most traditional ingredients for making corn tortillas. Afterward our experience with the family, we will visit a cemetery to see some more Day of the Dead traditions and how this indigenous town celebrates. Back in Oaxaca enjoy rest of evening and dinner on your own at leisure. 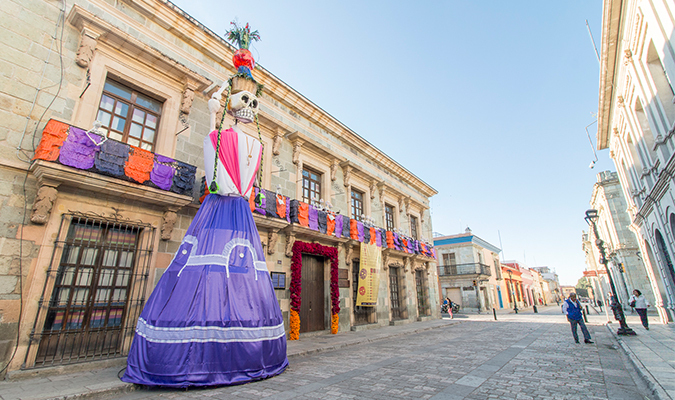 This day is designed to immerse you in the rich traditions and cultures that make up the vibrant state of Oaxaca. 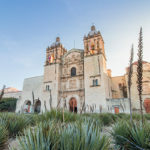 The group will visit the homes of local artisans in some of the small pueblos, such as San Bartolo Coyotepec and Santo Tomas Jalieza, just beyond the Oaxacan City limits. You will learn about the techniques involved in making black pottery, alebrijes, and backstrap loom weaving while meeting some of the most recognized artisans and craft-masters to witness and learn how they continue the traditions of making native crafts. You are guaranteed to meet people who will forever leave an impression in your life! This trip is programmed as a group departure preset for up to 14 people from October 28 to November 04, 2018. Programs and events may change slightly according to the festival calendar released later in the year. Prices start at $4,995 USD per person in double occupancy for this group tour.